Meet the Artist feature profiles artists whose works appear in the text. It provides biographical information and a brief history of the artist's work. Time & Place feature makes a historical connection to artworks that appear in the text. It provides students with a window into the historical and cultural context of artists and their works. Studio Activity, a hands-on activity found in narrative lessons explore ways for students to quickly grasp ideas presented in the lessons. They are specifically designed to require minimal time and resources. TIME Art Scene is written in an engaging magazine style. This colorful new feature closes every chapter with an update from the real world of art. 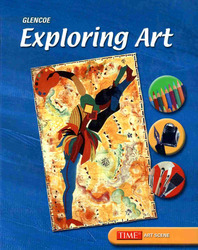 Students will read about various artists and discover how art is a part of the world outside their classroom. Each feature is tailored to fit the content of a particular chapter and contains a cross-curriculum activity to help students apply what they have learned. Studio Lessons within each chapter are provided that build on narrative lessons and studio exercises. Each one gives students the opportunity to use various media and techniques. The lessons are illustrated by examples of fine art and include exemplary student artwork. Narrative Lessons illustrate chapter objectives, using relevant examples from art, daily life, or history. Many also contain a hands-on Studio Activity with a Portfolio Application. The Computer Options feature within the Studio Lessons allows students to use the computer as a tool to create works of art. English and Spanish Glossary defines key terms and concepts. The Handbook enhances students' learning with Technique Tips, Digital Media Guide, Career Spotlights, and the Performing Arts Handbook. Artsource: Performing Arts Handbook correlates the visual and performing arts and offers background information, discussion questions, and a variety of creative expression ideas. Digital Media Guide provides a digest covering common digital hardware and software used in the arts classroom, plus practical advice to help students master this digital media.